We went to my daughter’s house for Christmas, and it was lovely. But the downside of being away is you get no leftovers; thankfully, she offered us the turkey carcass to take home, and so we did, despite her protestations that there would be no meat left on it. As soon as we got home, I lobbed it in the big slow cooker with some water, and left it alone for about six hours. The next morning, I surveyed the vegetable drawers. They contained sundry carrots, three courgettes on the edge of disaster, two fairly dried up leeks, four sweet potatoes in need of eating, and a rather soft swede. I small-diced the courgettes (half of one of which I had to throw away – how I hate that), the leeks, and half the carrots, and put them in the medium slow cooker with a little olive oil to cook down. Then I peeled and larger-diced the rest of the carrots, the swede and the sweet potatoes, and put them in a big pot to cook for root mash later. Then I turned to the turkey carcass – readers, there was loads of meat on it, so I picked it clean like a vulture. 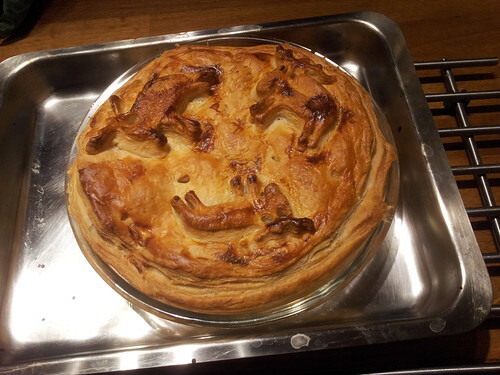 Then I foraged in the freezer for some puff pastry (yes, ready made – who makes puff pastry?). Took a pack of bacon lardons from the fridge and set them to cook off slowly in their own fat. When they were crispy, I added about a tablespoon of flour and cooked it in, a good splash of white wine from a bottle that was going over a bit in the fridge, and then some milk, until I had a nice creamy constituency. Added some chopped garden herbs, most of the turkey meat. and enough of the slow cooked veg to make the mixture fill a pie dish. Then Pete obligingly dealt with the pastry side of stuff (he’s much better than me at the rolling out side of things), and made these charming pastry moosen with a cutter that friends brought us back from Norway. We ate it with the root mash, and sprouts – there was enough of everything to repeat the performance the next day, which was fine by us. The rest of the veg went into the soup pot, with the remaining turkey meat, the stock and some barley. Not bad for “no meat”, eh? And here’s a picture of my Christmas cake, just because. 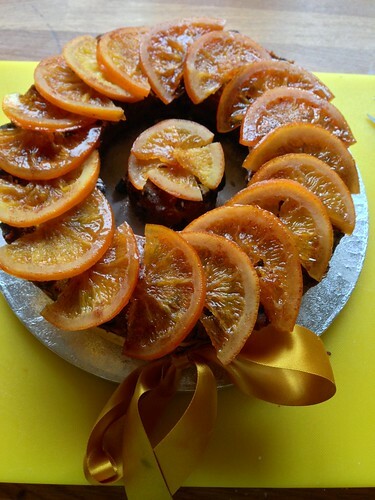 As I said a few weeks ago, I made it in a ring mould, and covered it the weekend before Christmas with orange slices caramelised in water, sugar and a hefty glug of Cointreau. Rude not to, really. One of the eight or nine smaller cakes went in the middle, and I added fresh holly on Christmas Eve.